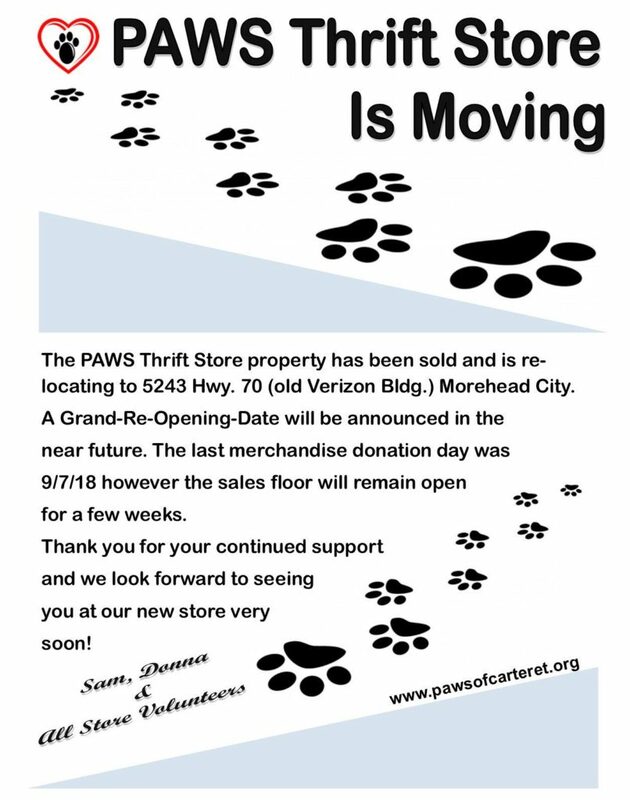 The PAWS Thrift Store, currently located at 3010 Arendell St. in Morehead City NC will be re-locating soon! A new location, 5243 Hwy. 70 in Morehead City (formerly Verizon-Cellular Sales) is being renovated to accommodate the store. The retail sales floor will remain open for a couple of more weeks as volunteers pack up. A grand re-opening date will be announced soon. This entry was posted on Monday, September 3rd, 2018 at 4:51 pm	and is filed under Uncategorized. You can follow any responses to this entry through the RSS 2.0 feed. You can leave a response, or trackback from your own site.